The Toyota Prius had set a new benchmark in the luxury hybrid car segment. The new Toyota Prius has been upgraded in terms of performance parameters and styling features. The exteriors feature new LED headlamps and fog lamps with daytime running lights. The new interior features introduced in this model include a multi-information instrument cluster with a head-up display and a new touchscreen display music system with 10 speakers. The safety features of seven airbags, including driver knee airbag, ABS with EBD and traction control, are featured in this model. Most of the automakers spend relatively more time on the drawing board when it comes to designing a hybrid or electric vehicle. There are no exceptions in the case of the Prius, as Toyota has paid special attention to the futuristic styling of this hybrid vehicle. It is indeed an attention seeker because of its unique design and for the fact that there are very few examples on our roads. Up front the Prius boasts of a sharp headlight cluster housing projector lamps along with a thin grille divided by the Toyota logo, which is highlighted in blue shade to tell that it’s a hybrid Toyota. On the front bumper it gets a wide air inlet that integrates fog lamps alongside vertically shaped turn indicators, which is a neat touch. The side profile of the Toyota Prius reflects a fish like design. The steeply raked windshield blends with the swoopy roofline that ends immediately at the angular shaped tail of the car. There is a sharp shoulder line on the side that erupts from the headlights and continues till the tail lights. The 15-inch wheels look a tad small in proportion to the well-sized body. The rear is the most attractive part of the Prius, where the hatch acts as a rear windshield blended with the roofline, which drops flat at the end, pointed with a sharp edge that looks like an integrated spoiler. The rear bumper is big and chunky and the vertical tail lamps are sharply treated with shiny bits, attracting good attention at the rear. The new Prius has received an interior with just enough changes to call it new. The car’s traditional high-mounted driver information cluster appears to have remained in place. In fact, this particular design strategy has been a staple for quite some time now, going all the way back to Asian models like the Toyota Vios.The multi-layered dashboard is a nice touch and I also like how the chrome trim creates a separate compartment for the new infotainment screen and the HVAC control buttons at the bottom. The biggest issue I see is the size and positioning of the gear shifter. It’s one thing for the shifter to be small or located in an unusual place. It’s another thing for it to be both, which is what you’ll get on the new Prius. The white surround does pop out from the mostly black interior, but it looks like it’s made of plastic. The mobile phone charger and the cup holders in the tunnel are nice and functional additions.For the most part, the cabin looks clean and smooth, although it might have been better off with a more traditional transmission tunnel instead of having the shifter resemble a video game joystick. The Prius uses Toyota’s Hybrid Synergy Drive that in this application comprises a 98hp, 1.8-litre petrol engine – that runs the efficient Atkinson cycle – and a 53kW (72hp) electric motor that draws power from a 6.5Ah nickel-metal hydride battery. Do note, the latest Prius is also available with a superior lithium-ion battery but the higher cost is sure to have ruled it out for India. The combined output of the hybrid system is 122hp.Getting going in a Prius is an occasion, or actually a non-occasion. Provided there’s enough juice in the battery, the Prius will come to life in full-electric mode giving you the opportunity to make a noise and emission-free getaway. The Prius can run in full-electric mode, and on battery power alone, at speeds up to 50kph but you’ll have to be gentle with throttle inputs to manage so; the combustion engine wakes up when the system senses that more power is needed, or simply when the battery needs charging. Full-electric mode is perfectly useable in city traffic and there’s ample power on call to keep pace with traffic. When the engine does kick in, you can feel the additional power at your disposal. With both engine and motor at work, the Prius does manage to feel brisk enough. What is good is that the CVT gearbox doesn’t spoil the experience as it does on the Camry Hybrid, with far less of that irritating ‘rubber band’ effect. But outright performance is anyway not the focus here, fuel economy is. The Prius boasts an ARAI-tested fuel economy of 26.27kpl, though the car’s onboard computer showed a figure closer to 18kpl on our drive that included city streets and smooth moving highway stretches. Think about it, only a few small cars deliver that sort of efficiency. Also impressive is the Prius’ overall level of refinement. The petrol engine runs quietly for the most part and only sounds strained when you really extend it, while much of the other sounds from outside stay where they belong.The new Prius is the first car to be built on Toyota’s new modular TNGA platform that will eventually underpin everything from compact sportscars to SUVs. And if the Prius’ generally impressive driving manners are a sign of things to come, there’s a lot to expect from future Toyotas. Yes, this is a Prius that you can actually have some fun behind the wheel of. It does roll considerably in the corners but the steering feels nicely weighted and offers pretty good feel, and there is good grip on offer too. Even brake pedal feel (the Prius uses regenerative braking) is much improved. And though squeaky, the low rolling resistance tyres also hold on quite gamely. Make no mistake though. The new Prius is not a sporty car. But rather than feeling like an appliance as old Prius models did, this one feels like a nice-to-drive mainstream car. For one, it’s a whole lot nicer to drive than Toyota’s own Camry Hybrid. Strong disc brakes clamp down on the front as well as the rear, and we thought that the overall braking quality was superb. Cornering is easy, and slowing down and halting requires little strain. There is no body roll, but high speed does shake up the inside a bit. Coming to the suspension system, there is a McPherson strut armed onto the front axle. We thought that the overall ride was comfortable enough, but conditions could defer depending on the road terrain. The vehicle absorbs moderate road anomalies well, and we thought an average Indian passenger would feel quite satisfied with the overall comfort. The Toyota Prius Hybrid features has ventilated disc brakes at the front and solid disc brakes at the rear. The firm grip on the road by the alloy wheels is further improved with anti-lock braking system, brake assist, electronic brake force distribution and traction control, assuring effortless driving on all sources. The safety features in this variant include airbags for the driver, co-passenger, side airbag at the front, curtain airbags at the rear and driver knee airbag. 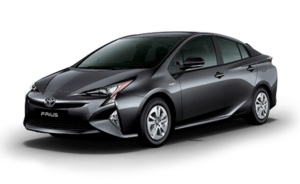 Here’s the thing with the new Prius ­­– given the lack of support from the government in terms of taxation, it is expensive. What’s more, one can buy more conventional cars for similar money that offer better features, more driving fun, and even higher practicality and comfort. What these conventional cars lack, however, is a statement. So, if I had an M3 in my garage to burn both fuel and rubber over the weekends, and I had judgmental friends at the club, I’d buy the Prius as my second car in a heartbeat; you know to handle the daily commute and put a lid on the club gossip. Toyota Prius Z8 Ex-showroom Price is 44,95,034/- and On Road Price is 47,29,000/- in Pondicherry. Toyota Prius Z8 comes in 7 colours, namely Emotional Red,Attitude Black Mica,Grey Metallic,Silver Metallic,White Pearl Crystal Shine,Super White,Dark Blue Mica Metallic.Test drive for Toyota Prius.